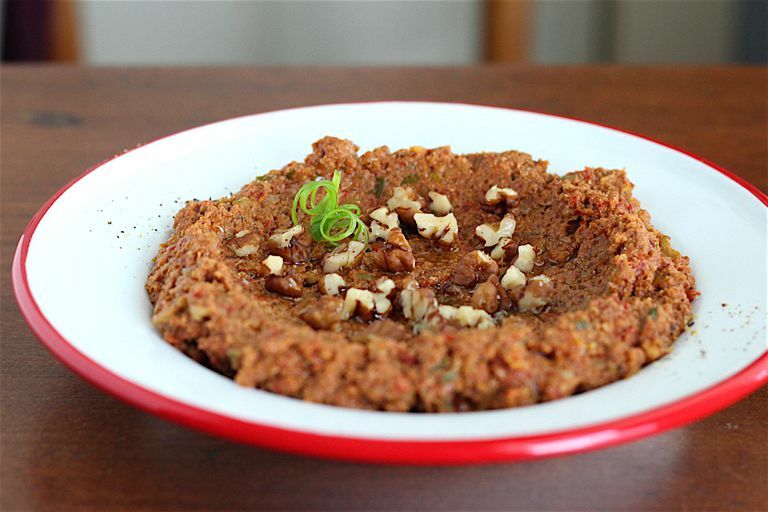 This low-FODMAP version of a popular dip, called muhammara, is made with homemade garlic-infused oil to bring out a pronounced garlic flavor while keeping FODMAPs to a minimum. This versatile dip is great with crackers or low-FODMAP veggies; it tastes amazing as a sandwich spread, tucked into omelets, or tossed with pasta. In fact, there aren’t too many places where its flavor doesn’t shine. Preheat oven to 350F. Place walnuts on a baking sheet. Toast until they darken slightly, about 10 minutes, stirring once or twice. Remove from the heat and set aside. Watch closely, as nuts burn easily. Replace homemade garlic infused oil with ¼ cup commercially prepared garlic oil. Garnish with additional chopped walnuts and olive oil if desired. To make this recipe gluten-free, use gluten-free, low-FODMAP bread crumbs. You can use the technique in this recipe to make garlic-infused oil for use in other recipes as well. Homemade garlic-infused oil must be used or frozen within four days to avoid the risk of food-borne illness. Commercially made gluten-free breadcrumbs can be used if they don't contain onion or garlic. Or, make your own. Tear 2 slices of low-FODMAP gluten-free bread or sourdough bread (which is low-FODMAP because of the fermentation process it goes through) into 1-inch pieces. Place on the baking sheet with the nuts. Toast until golden brown on the bottom, 4 to 5 minutes. Turn pieces over and toast until golden on the other side, 4 to 5 minutes more. Cool in the freezer for 5 minutes and pulse in a food processor or blender to make crumbs. Pour off and set aside. No need to clean the processor bowl in between making breadcrumbs and dip.